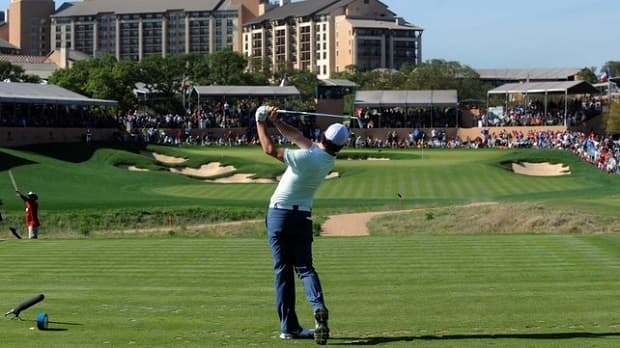 The Valero Texas Open is set to tee off this Thursday 26th March, and with just Houston left on the PGA Tour before the Masters, this is one of the last opportunities for players to grab a ticket to Augusta. The Texas Open is held on the AT&T Oaks Course at TPC San Antonio, and with it’s unique conditions, tends to throw up shocks on a regular basis. With that in mind, we’re chancing our arm at finding a winner at a huge price. One thing this Greg Norman designed course has become renowned for over the last few years has been the amount of surprise winners it throws up. Last year Steven Bowditch took the title at massive odds of 350/1 351.00 +35000 350.00 350.00 0.00 , in 2013 Martin Laird won at a cool 100/1 101.00 +10000 100.00 100.00 -0.01 , and Ben Curtis was another three-figure winner when he returned 150/1 151.00 +15000 150.00 150.00 -0.01 for taking the tournament in 2012. One of our tips for this year, Brendan Steele, was a 300/1 301.00 +30000 300.00 300.00 0.00 shot when he took the Texas Open in 2011, and you have to go back as far as 2010 for a more reasonably-priced winner, when Adam Scott won at 25/1 26.00 +2500 25.00 25.00 -0.04 . All of those winners went into the tournament in poor form, and it’s difficult to predict who will pull it together on the day, but in light of that record, it makes sense to have a small punt on a few different players at huge odds, and if just one of them lands, we’ll make a tasty profit. The course has become a graveyard for favourites over the years, and it is an extremely testing one. The AT&T Oaks course is a par 72, spread over 7,435 yards. It’s an untypical US golf course and has been compared by many with the sandbelt courses of Australia. Three of the four par 5 holes on the course stretch over 590 yards, and all of the fairways are particularly tight. Greens are undulating and multi-tiered, and arguably the biggest challenge is the fierce Texas wind. Those factors combined make this a real test, and although longer hitters have an advantage, accuracy is also important. Strong winds are forecast for the first day’s play on Thursday, so it may just be a case of hanging in there for the opening day, and waiting for the weather to improve later in the weekend – which at the moment it is forecast to do. We’ve laboured on the point that this tournament often throws up shocks, but it is worth pointing out that the market is headed by two excellent golfers who are both in great form. If anyone is to break the sequence of high-price winners, Jordan Spieth and Dustin Johnson could be the men to do it. Both players won last time out, and both would love to boost their Masters credentials with back-to-back wins. However, we prefer to look at some of the lively outsiders, and we’ve picked out three players who have got decent chances at fancy prices. The first of those is 2011 winner Brendan Steele. He recently declared that the AT&T Oaks is his favourite course on the PGA Tour. That may not come as a huge surprise as it was the location of his only Tour victory, but he clearly relishes the challenge of the unique course and that’s a definite positive. He’s yet to qualify for the Masters, and is 99th in the OWGR, so he has extra motivation to rekindle his win of four years ago. He was 4th when defending his title the following year, so has good course form, and also has shown some very good recent form to boot. He finished runner-up in the Humana Challenge, and achieved a personal best at the Honda Classic, finishing tied 10th. He was playing well enough in Orlando last week, before a last round of 76 left him way off the pace, but he still arrives here in decent nick. For one of our big outsiders, we’re tipping Pat Perez to continue his fine form in Texas. The American can be an inconsistent player, but he has also said that he enjoys this course – which is backed up by his record here – and he has a very good record in the state of Texas. He’s played in the Texas Open three times in his career, finishing tied 22nd on his first attempt in 2010, 5th in 2011, and 11th in the tournament last year. Overall in Texas he has five top 12 finishes in his last 11 starts. That’s not bad for a player at such massive odds, and he’s also got some good recent form in the bag after finishing 4th at Pebble Beach. He’s a player who seems to be enjoying his golf again, and recent quotes about how well he’s working with his new coach also add confidence. He’s definitely worth an each-way shot at those odds. The same could be said of our third tip, Scott Piercy. He’s another who is yet to qualify for the Masters, and he currently occupies 97th on the OWGR. He’ll have plenty of motivation to do well here, and his price is plenty big enough for a player who has won two PGA Tours in his career. He finished runner-up in this year’s Sony Open, and although he doesn’t have any very recent form to speak of, he’s hit rounds of 64 and 65 round the San Antonio course in recent visits here, so he has the ability to handle the course and could be primed for a good tournament at a huge price.